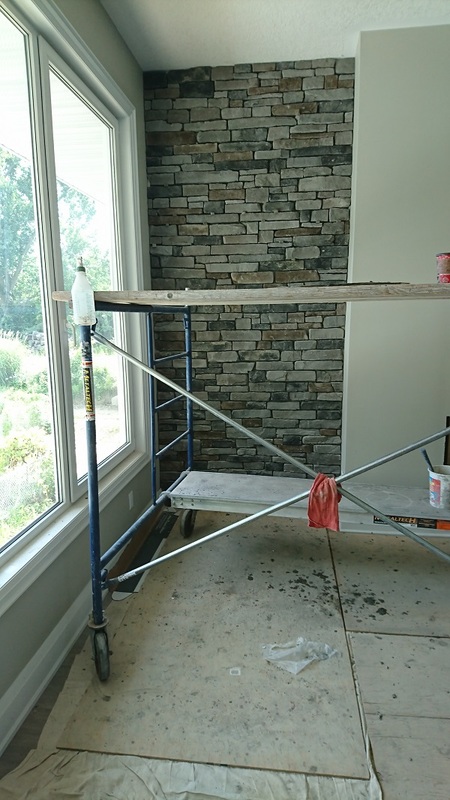 Stone veneer accent walls before the application of stone veneer. People are often looking to create unique designs using stone veneer. Stone veneer on the inside of a home is usually seen as part of the fireplace. 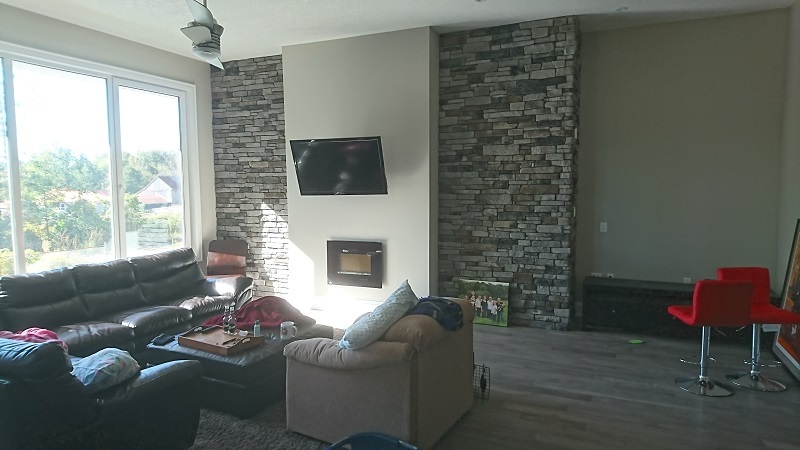 With this project the clients decided to go with a bold look featuring a fireplace on the middle of the living room wall with two identical stone veneer accent walls on either side. 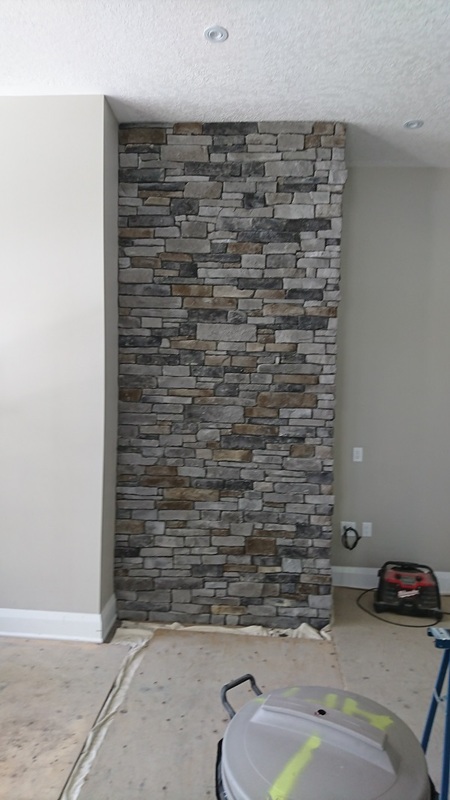 In this case we installed stone veneer accent walls with a dry stacked stone veneer featuring Pennsylvania Ledge stone by Stone craft. The result is a very modern look which really makes this living room stand out. The same stone was included as a wainscot for the out side of the house. To learn more about the application of stone veneer as a exterior wainscoting check out or blog on cultured stone wainscoting. The home owners decide to go with the dry stacked application as they were looking for a modern look yet with a more rustic feel. The dry stacked stone veneer reminded the homeowner of the stone walls of her native Scotland. Right side of living room accent wall featuring dry stacked stone veneer. The image above shows the stone veneer being applied directly to cement board. This works well for interior applications but is not recommended for exterior applications. Especially where there will be freeze thaw cycles through the season. 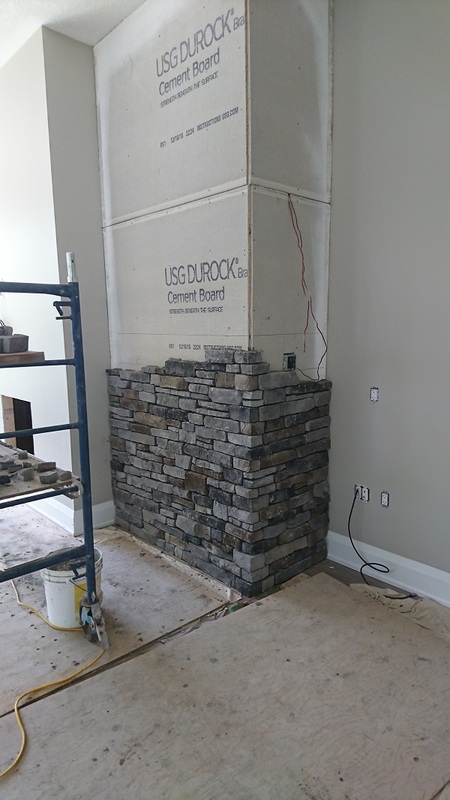 The above image shows the other side of the fireplace wall with a completed application of stone veneer in a dry stacked pattern. Notice the care we take to ensure the protection of the floors with both cloth drop sheets and plywood. These stone veneer accent walls were the feature of this large addition to an existing farmhouse in central Ontario. Besides the fireplace with stone accent walls in the living room, the addition included a large eat in kitchen and a new master bedroom all built over a full usable basement. As mentioned earlier the same stone was used on the outside of the house which will be the feature of another blog. 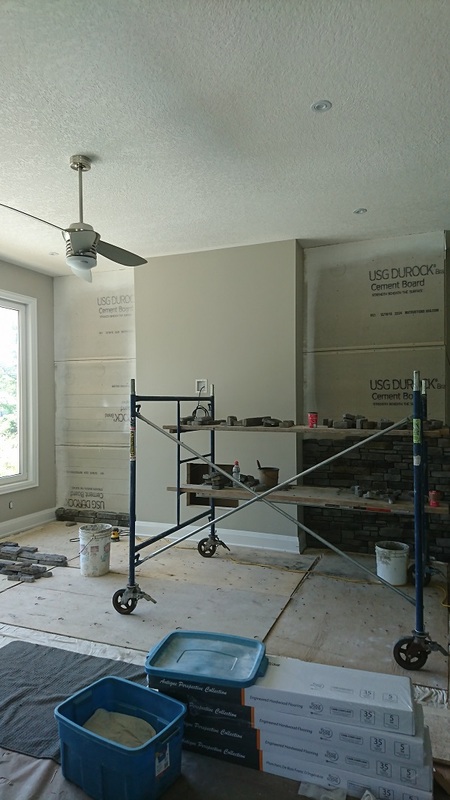 The image below shows the completed accent walls in a finished living room.